Will the destiny and fate of the devil be to live forever or will God end his existence? When will he receive his fate? Can spirit-composed beings, like angels, be destroyed with no hope of a resurrection? Does the devil possess eternal and immortal life? This short article will show that God definitely does have the power to put to death forever the devil, demons, and humans, who willfully disobey him. Before discussing the fate of demons, and the devil in particular, we need to define two terms. Eternal life is a state of existence granted by and continually sustained by God and is conditional on obedience to him. Immortal life, on the other hand, is life that springs forth from itself. It is not dependent on any other source to continue as it is self-sustaining. This study shows why the devil only has eternal, not immortal, life. When did a demon do God a favor? Picture of the real Hell! Although the Creator God, who became Jesus Christ, has authority over life and death (Deuteronomy 32:39 - 40; 1Samuel 2:6; 2Kings 5:7), God the Father has absolute power over everything (John 5:21 - 23, see also Matthew 10:28). Only God and Jesus, at the present time, possess life immortal. Just because a created being is made of spirit, like the devil or other angels, does not necessarily mean they too have immortality and can never die. Jesus confirms this fact when he reveals the final fate of anyone who totally rejects God and His righteous ways. 'Then he will say to those on his left (in the Judgment), 'Away from me, you that are under God’s curse! 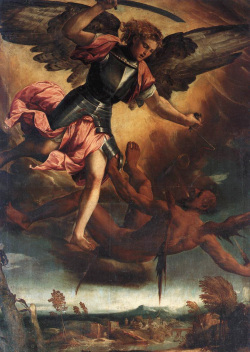 Away to the eternal fire which has been prepared for the Devil and his angels!'' (Matthew 25:41). Why is a fire prepared for the devil and his demons if, because they are spirit, they cannot be harmed by it? Many make the assumption, based on a misinterpretation of what Jesus taught in Luke 20, that angelic beings inherently have immortal life and cannot be put to death. He stated, "But those who are accounted worthy to obtain that age . . . neither marry nor are given in marriage; And neither can they die any more, for they are equal to the angels" (Luke 20:35 - 36). Jesus is only answering the Sadducees' question of marital status in the Kingdom of God. He is not addressing the question of eternal life or immortality and certainly not the devil and the status of his existence. His primary point is that like angels who do not procreate, humans who are resurrected and changed into spirit will also not produce children. Those who are part of the first resurrection are given immortal life as sons of God (Hebrews 2:9:10, 1Timothy 6:12 - 16, etc.). Angels, even the ones like the devil who turned evil, are eternal. But they are not spirits that are immortal. Their life, as shown in many scriptures, can be ended by the One who gave it to them. What is it that evil spirits, even the devil, know about God that would make them tremble in fear? This question is answered in Mark's account of Jesus meeting a man in a synagogue who was possessed with a demon. In verse 34 above the word "destroy" is a translation of the Greek word appolumi. It means to destroy fully and completely. This same word is also used to describe the utter destruction of people and places (Matthew 10:28, Luke 17:29, etc.). The question asked by the demon is instructive as it tells us something about their life and existence. Evil spirits like the devil are aware they can be put to death forever. They also understand that Christ has the authority to do so to anyone who disobeys God. After the millennial reign of Christ the devil will be permitted, for one last time, to actively deceive others. After this last great evil act Lucifer, the angel who became God's chief adversary, will receive what he justly deserves for what he has done (Revelation 20:7 - 10). The devil will not, in spite of what some religious people might think, be tortured forever as his punishment. The Bible strongly indicates his life will be stopped - he will no longer exist AT ALL. He will be put out of his misery and his life terminated so that he no longer causes himself or others any problems. Although Ezekiel chapter 28 seems to discuss a human king of Tyre, the description of his appearance and responsibilities clearly point to it referring to the devil. God also tells us through Ezekiel that Satan's destruction will be final and complete. He will be put completely out of existence! The devil will receive one of the worst penalties for his willfull sins - eternal death and separation from God (Romans 6:23) made possible by the Lake of Fire (Revelation 20:7-10). Is there a worse fate than being dead forever? We can pick up clues to a possible answer through the response some devils gave Jesus just before he casts them out of a person. They cried out to him, "What do You have to do with us, Jesus, the Son of God? Have You come here to TORMENT US . . . ?" (Matthew 8:29). Notice that these devils greatly feared that a torment or torture would come to them before a certain time. What are these demented spirits talking about? The small book of Jude informs us of at least two kinds or types of punishment when it states, "And the angels who did not keep their own original domain . . . He is holding in eternal bonds under darkness . . . are themselves exhibited as a perpetual example of undergoing the punishment of eternal fire" (Jude 5 - 7). These verses show that at least some angels that believed the devil and became evil are restrained until they receive their punishment which is eternal fire from God. Another set of rebellious spirits, however, will receive a slightly different fate. Jude goes on to state, ". . . wandering stars, for whom has been reserved the blackest darkness forever!" (Jude 13). It seems, from what little evidence the Bible offers, that some evil spirits will exist in the darkness of a prison forever with no means of escape. God does not need to "do" anything special with such rebellious spirits, as their own sick and twisted minds become their punishment. As for the devil, he will have his existence forever blotted out. How big is the army of the devil? The most evil people in the Bible!